Sharon Wirant owns and operates Unleashed Potential Coaching. She coaches and inspires dog trainers in building confidence, preventing burn out and overwhelm, enhancing harmony between animals and people, and creating a life and/or business as they envision. Wirant worked with the ASPCA for a decade. Most recently she was a Senior Manager for the Anti-Cruelty Behavior Team (ACBT) where she behaviorally assessed animal victims of cruelty. She also managed the Shelter Behavior program in a temporary sheltering environment for the animals seized from cruelty and neglect cases, managed a roster of talented Behavior Responders, assisted Response Partners with behavioral concerns, and participated in ACBT educational efforts. During her time with the ASPCA, she also taught and conducted the SAFER® Aggression Assessment and Canine-ality Adoption programs for shelters across the nation. She also served as a reviewer for the SAFER® Aggression Assessment Certification program. Previously, Wirant served as Chief Operating Officer at the Monadnock Humane Society in West Swanzey, New Hampshire. Wirant’s work on the urinary behavior of dogs has appeared in the journal, Applied Animal Behaviour Science on several occasions. Wirant earned both a B.A. in biological sciences and neuroscience and an M.A. in biological sciences with a specialization in animal behavior from Smith College. She is an Associate Certified Applied Animal Behaviorist, Certified Professional Dog Trainer, Certified Behavior Consultant Canine, a graduate of the Karen Pryor Academy for Animal Training and Behavior, and a certified Life and Health Coach. Wirant resides in New Hampshire with her husband, Mark, six dogs, three barn cats and a smallish flock of sheep. 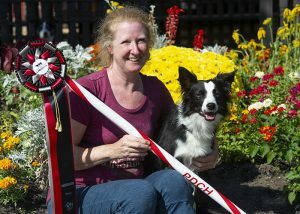 Wirant and her husband are active competitors in the sport of dog agility and dabble in sheep herding with their three border collies.